You can see in the right hand column that I sometimes receive free products and services in exchange for a blog post (and other promotion). 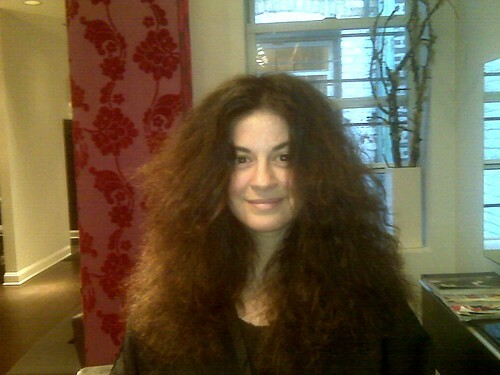 I will happily disclose that my friend and stylist Todd Fischer manages my mane in return for some publicity. This is a harder job for Todd (who works at Free Nation of Beauty) than it is for me. I have crazy hair! and Todd is a great stylist so it is simple the truth when I say great things about Todd. 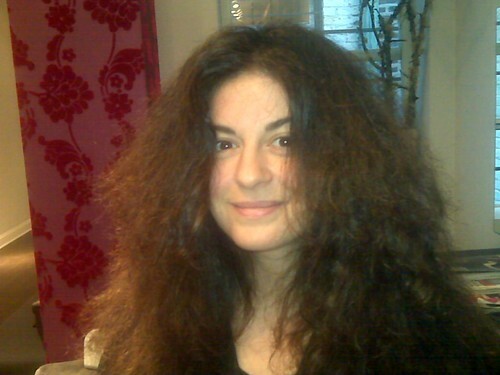 We took before and after pictures of my hair because I wanted people to realize HOW CURLY and frizzy my hair is when it is simply washed and dried. Todd is a miracle worker, let the photos serve as evidence. First, Todd washed my hair thoroughly with a clarifying shampoo. At least two washes with a shampoo which is clear of Sodium Chloride and no conditioner before the treatment. The hair must be absolutely clean and free of any product to ensure that the Keratin is properly absorbed into the hair follicle. We then trimmed my hair because I needed it desperately. Next Todd sprayed the keratin treatment into my hair, section by section, making certain that every last strand of hair was saturated by the treatment. 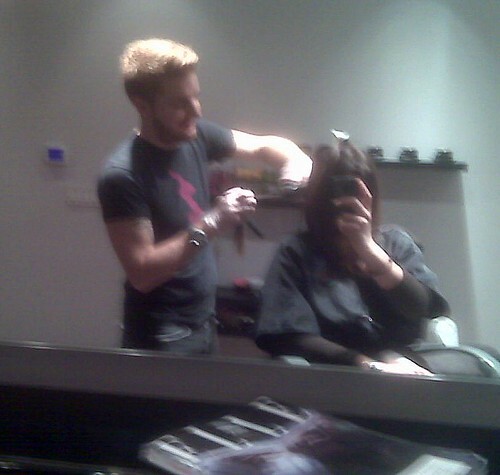 After my hair was saturated with the treatment, Todd blew it dry. My hair was completely blown out, bone dry. Next was the flat iron process. Todd took pieces of hair, about two inches of hair, and flat ironed my hair. I tried to capture the steam coming out of my hair but it was difficult to catch. The flat iron process took about 35 to 40 minutes as we had be certain that each strand was ironed. The heat infuses the treatment to the hair. It takes a long time. I was in the salon for close to three and a half hours (including my cut & color). 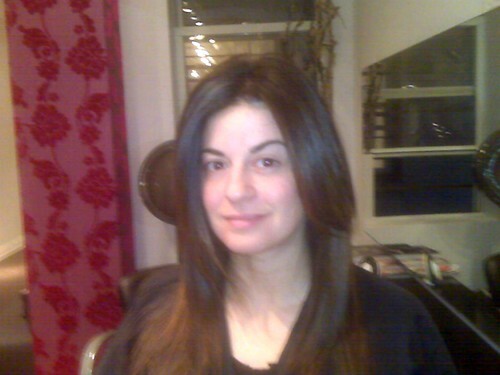 Without a cut & color, you should still expect to spend an hour and a half to two hours in the salon. But, you'll come out looking as fabulous as a P. Diddy era J. Lo at the Grammy's. There is an odor. I was not bothered while Todd was spraying the stuff into my hair but during the blow dry and the flat iron my eyes burned and it made me cough. I know, it sounds scary but it is in the name of beauty. It is not cheap. The process runs about $350 and lasts between 8 weeks and four months. You cannot wash your hair for 48 to 72 hours after the process. You also cannot tuck your behind your ears or put it into a pony tail. The hair must remain completely STRAIGHT. (Don't tell Todd but by day 3, I had to put my hair in a pony tail, in fact, it is in a pony tail right now). The MOST important part of this process is after care. Once you receive the Brazilian Hair Straightening, you must wash your hair with a shampoo which does NOT CONTAIN SODIUM CHLORIDE. Todd recommended to brands of Shampoo: TRESemme which you can find just about everywhere and Pureology which is a salon brand. Wow, what a process but you look GREAT!!!! I was looking for More Dresses and was wondering if Anna Sui is the best designer for More Dresses?